A Filipino nursing supervisor in Houston, Texas has been reported missing since February 16, according to his family. 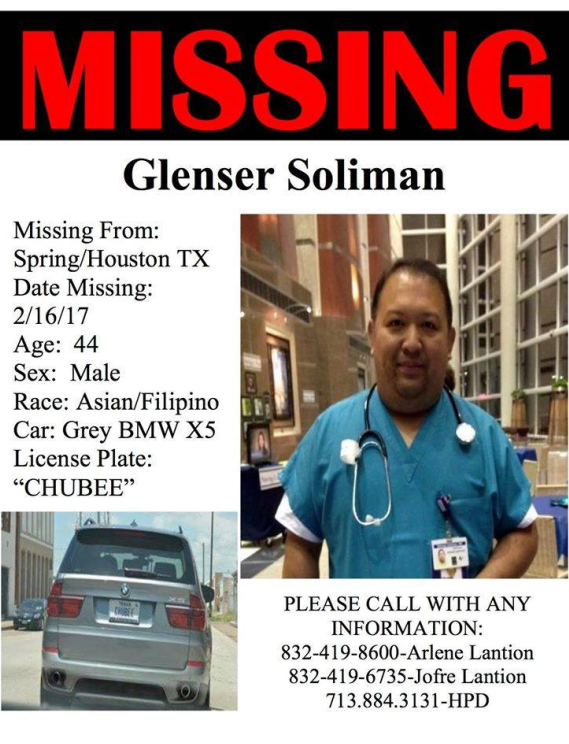 Glenser Soliman, 44, who is connected with St. Luke’s Hospital in Houston, did not show up for his overnight shift Thursday and has been nowhere to be found since. Family members say Soliman is a responsible, routine-oriented person who would never just disappear. Soliman’s car is a gray BMW X5 with a personalized plate “CHUBEE.” Soliman’s relatives have checked tow shops, hospitals, accident reports and retraced his work route. “The iPad has an iPhone locator and it’s offline. All this time we’ve tried the phone and it’s going to voicemail directly,” said Lantion. The family has filed a missing person’s report with Houston Police.